The K12 Nissan Micra was not a fast car, even in lightly-warmed 160SR spec (which had just 108bhp). Having driven one, it stands out in my memory as one of only two cars to give me actual back pain. The other was a K11 Micra. Buy this one, though, and you’ll have rather more to think about than how any specific part of your body feels. 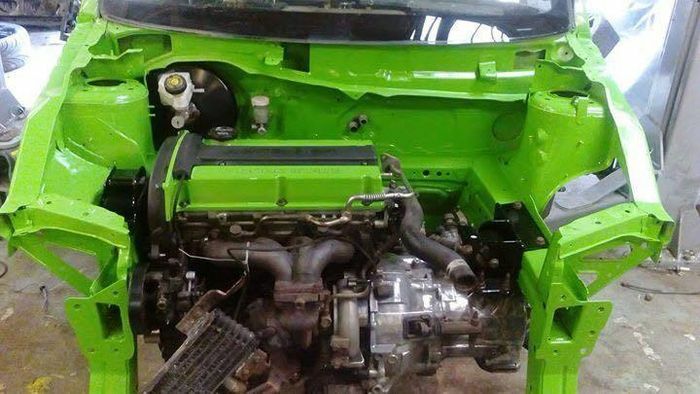 What we’re looking at is a heavily-modified K12 Micra with Mitsubishi Lancer Evo running gear. Yep, that means this 3.7-metre biffabout has permanent all-wheel drive. 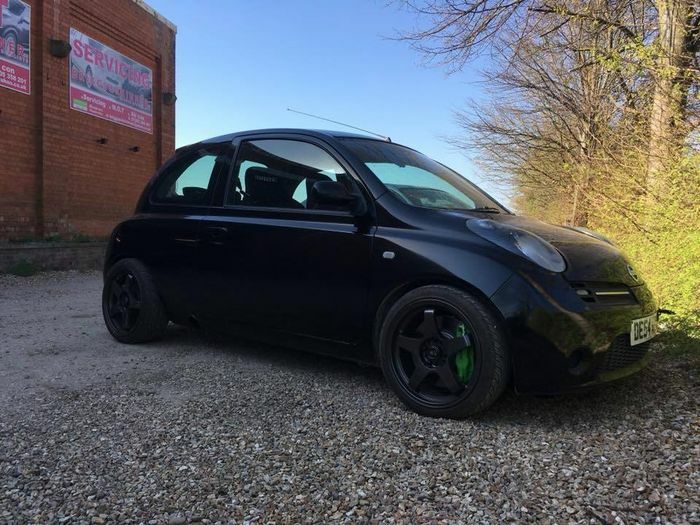 The 2.0-litre engine is an Evo VI unit, the five-speed manual gearbox is from an Evo IV, the front Brembo brakes are lifted from an Evo VII and the turbo was originally found on an Evo IX. Built by the chaps at Turbomonkeys as a show car, it has been exhibited for a few years but covered minimal mileage in that time. It’s finished in black with Kermit-green accents. 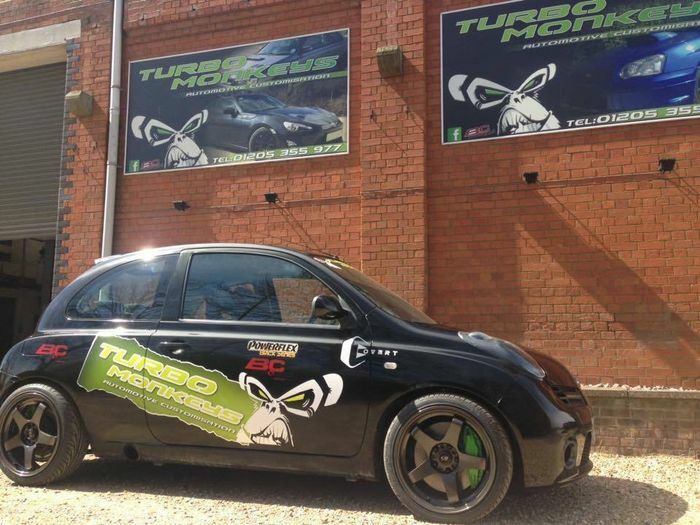 All stickers and graphics have been removed, making it a superb sleeper – it just looks like a lightly riced Micra. The astonishing build also includes an Evo power steering system, a Subaru rear subframe and ‘wide-track’ rear hubs from a WRX STI. Amusingly, Evo dials have been slotted into the Micra dashboard. 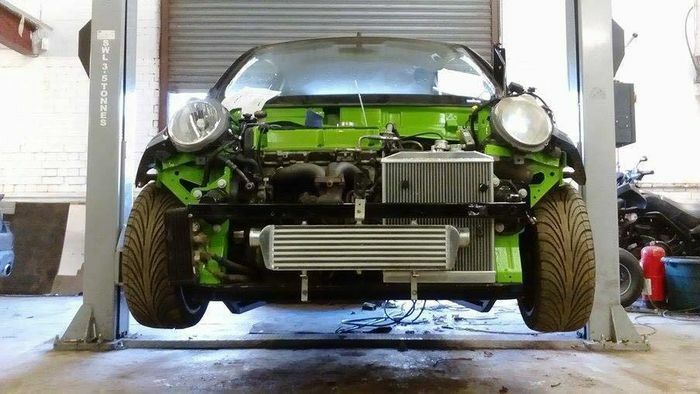 There’s a whole list of custom additions like a 30cm-shorter prop-shaft, bespoke wiring loom, a unique intercooler and a subframe made specifically for this car. Randomly, there’s also a Honda Civic alloy radiator. The new fuel tank is now in the boot, the Bride bucket seats will stop you falling out and all the remaining Micra features work, like the central locking and electric windows. To the drive-thru! Just watch those lovely 17-inch Rota alloys on the kerbs. One slight drawback to this £9995 piece of automotive insanity is that the engine hasn’t been properly tuned yet. The basic Evo IV ECU can’t be mapped, but for the buyer’s reference, an Evo VII one can. As Turbomonkeys never needed to performance-test it, they never bothered. 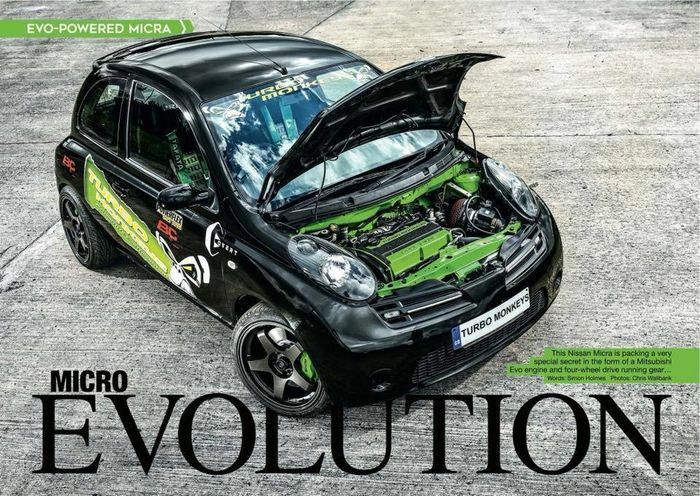 The car made it to a six-page feature in Banzai magazine anyway, but a remap will apparently take it to a comfortable 400bhp. 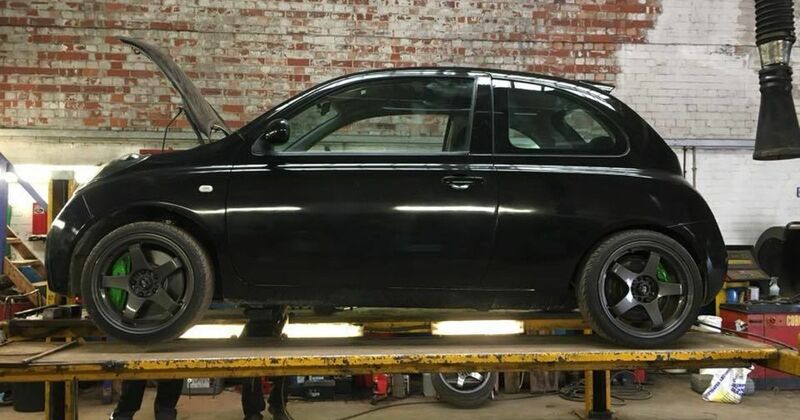 It is, however, road-legal according to the 12-month MOT certificate applied to it. So: for ten grand, would you? Hat tip to Lewis Kingston!